Time has flown this year, more so than in other years I feel, and even Christmas has whizzed by in a blink of an eye and 2019 is just two more sleeps away. 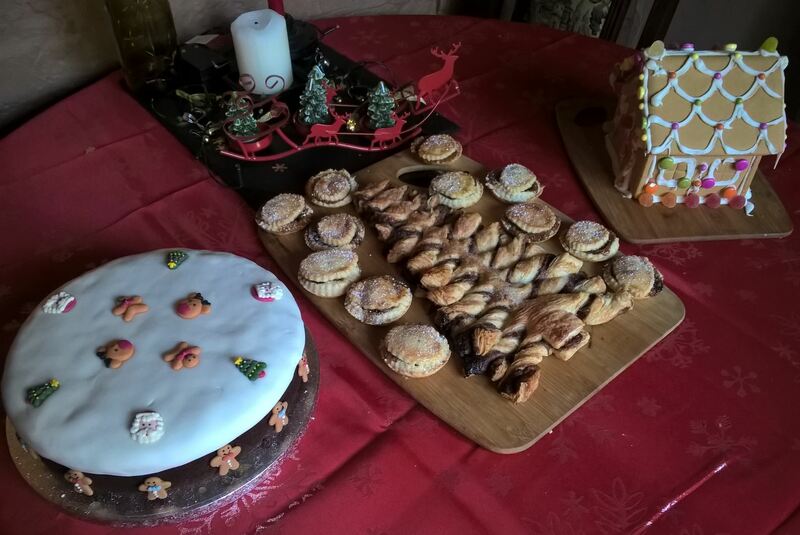 This Christmas I’ve baked new and old favourites and will be making more sweet treats for the Mudlets over the next day or so. The Nutella Tree looks impressive but is oh so simple to make! When the Nutella Christmas Tree recipe popped up a few weeks ago, I saved the link deciding there and then that Christmas was the perfect time for such a delectable creation. Pastry has never been my thing and so I confess to using ready made puff pastry. I did think it would be harder to make than it looked and was pleasantly surprised to find that this was not the case and before very long, the Mudlets were taste testing, dipping the pastry fingers into Nutella spread for added flavour. All in all I was rather impressed with the finished look of the Tree and it was every bit as messy and delicious as I expected it to be and is definitely on the ‘make again’ list. The Mudlets’ had fun constructing and then decorating a ginger bread house from a kit bought for the respectable price of just £4. It has taken pride of place on the Christmas table and the Mudlets’ are looking forward to actually eating it. They each did two sides and half the roof and have graciously said the Mud and I can have a bit each as well – cheers girls! Nigellas’ Chocolate Christmas cake has also been a success again this year, although Mud reckons it’s too dry for his liking, preferring instead Christmas cakes I’ve made in previous years, which have been stored in a cupboard and liberally fed brandy over a period of several weeks. I like both and will take his comments on board with a view to possibly making one next year ……. if I remember in time that is. 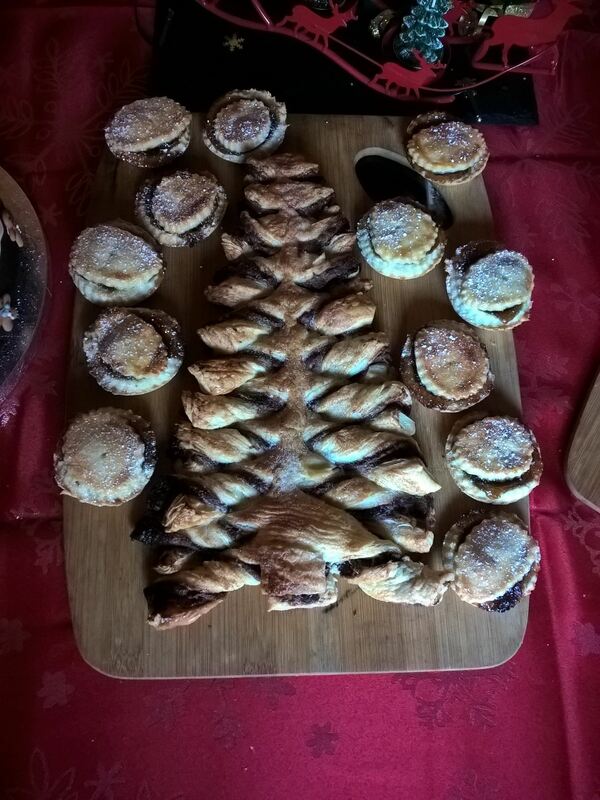 My final Christmas creations this time were mince pies, jam tarts and lemon curd tarts. Again, I used ready made short crust pastry and the Mudlets have happily partaken of them throughout the week and such was their enjoyment of the pies and tarts that only three out of 36 went to waste. I’ll definitely be making more of these if for no other reason than to use up the half jar of mince that is still in the fridge. Highly recommend these little rolls – very soft and tasty. Then today I decided to try out an Essex Huffers recipe that Anne from Slamseys journal had posted several weeks ago. 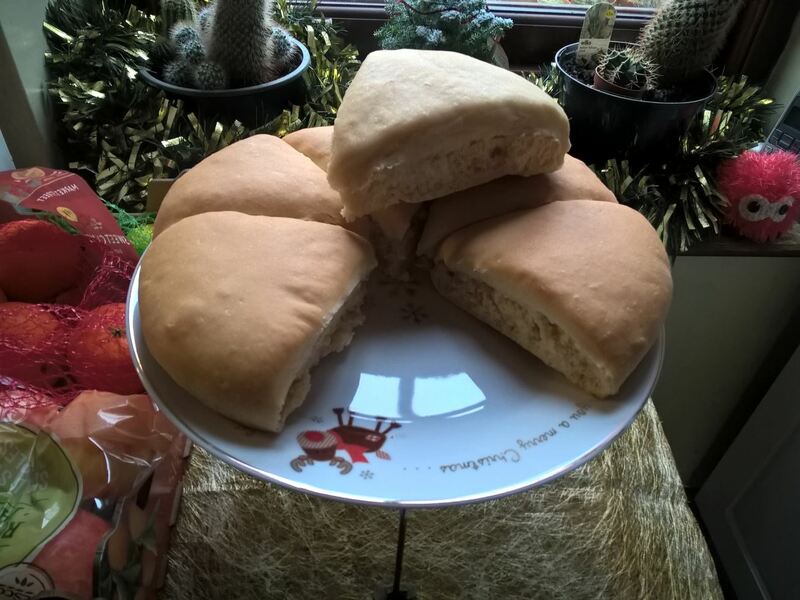 The recipe was ever so simple to follow and the resulting triangle shaped bread rolls are both light and tasty. The Mudlets’ each tried one for supper and said they were the nicest bread rolls they had tasted. These are well worth the time to make and I would definitely recommend making these if you have a spare hour or so. Thank you to all those who have supported, liked, followed and/or commented on my posts through out this year. I hope that you all have had a very good Christmas and I would like to take this opportunity to wish you all a very Happy, Healthy and Prosperous New Year. Tried the chocolate spread version but fear it’s too late now to make the savoury one.